Women’s Ministries at Lake Park offer a variety of ways for women to connect with each other, deepen their faith lives and explore God in the world. All women are welcome to join in the fun! 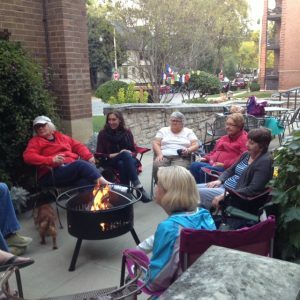 This group meets on the third Wednesday of each month. During the school year we meet at Cafe Hollander on Downer Avenue and during the summer our location varies. Sometimes our conversation is focused with a book or topic and other times we just meet for fellowship and relaxation! Held monthly in the fall and spring. In a little throw back to grade school we bring an item, based on the topic for the evening, to share with the group. These gatherings are hosted by a different member each month. Though men are always welcome, we’ve so far only seen women at the monthly gathering of knitting, crocheting, weaving and other hand crafts. The group meets on the first Thursday of the month at various members homes. Held annually, often in January or early February, the Women’s Retreat offers a time of respite. In the past we have done walking prayers, learned about the creeds, discussed self-esteem, etc. For any questions about hosting or timing, please contact the church office!